The image was taken by Jean-Luc Dauvergne in August 2007 from the observatory at the Pic du Midi mountain. The gas and dust of the North America Nebula glow pink and red in this skywatcher photo. 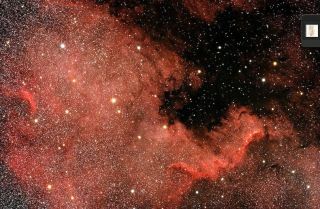 The North America Nebula lies in the constellation Cygnus, and it takes its name from a supposed resemblence to the continent. It is an emission nebula — essentially, a cloud of high-temperature gas emitting light of various colors. The image was taken by Jean-Luc Dauvergne in August 2007 from the observatory at the Pic du Midi mountain in the French Pyrenees. The skyscape in the image glowing most brightly is the most active part of the nebula, a region astronomers call the Cygnus Wall. Here, hydrogen gas burns where new stars are forming. The North America Nebula, also known as NGC 7000, is roughly 1,800 light-years away and perhaps 100 light-years in diameter. A light-year is the distance light travels in one year, or about 6 trillion miles (10 trillion kilometers).